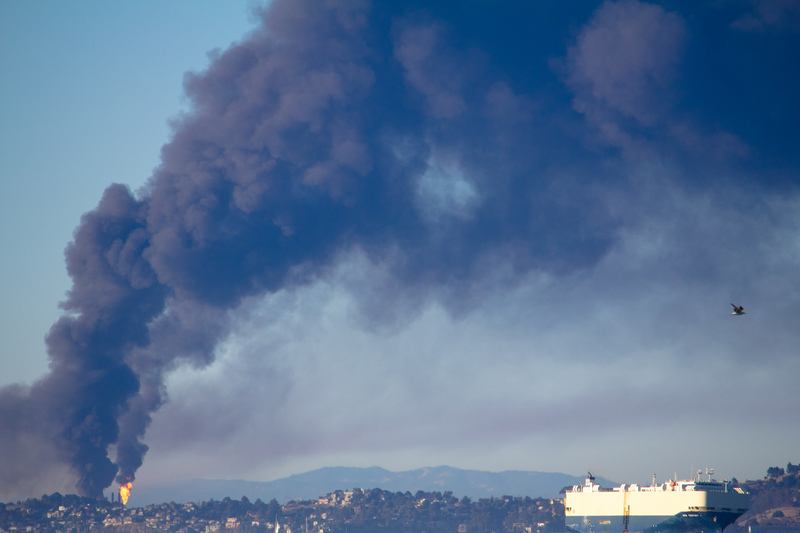 A view of Richmond, California, as a Chevron oil refinery burst into flames in August, 2012. Image used under Creative Commons from Jonas B. Nearly six months after a massive fire at a Chevron oil refinery in Richmond, Calif., the state bureau of the Occupational Safety and Health Agency (OSHA) has levied a $963,200 fine against the American corporation. OSHA’s report cites 25 breaches of safety regulations leading to the Aug. 6, 2012, blaze, including such “willful serious” violations as not replacing a corroded pipe (which ultimately ruptured, leading to an explosion) and ordering workers enter the premises and erect scaffolding at the leak site. At nearly $1 million, the fine is the highest in OSHA’s history. While no employees were injured in the blast, the explosions and ensuing blaze at the No. 4 Crude Unit sent thick, black plumes of smoke into the twilight sky over the San Francisco Bay. Residents of Richmond, as well as other municipalities in West and Contra Costa counties, were advised to stay indoors to avoid breathing in the emissions. The Richmond Medical Center reported that “several dozen” people had come into the hospital complaining of respiratory problems. Other sources put the figure as high as 15,000 across the Bay Area. This is at least the third fire in the Richmond Chevron refinery in the last decade. One function of OSHA-compliant safety signage is to indicate what personal protective equipment is necessary on a work site. Ellen Widess, head of Cal/OSHA has defended the fine, stating that “investigators found willful violations in Chevron’s response before, during and after the fire.” $1 million is the maximum penalty allowed under California state law. A full detailing of these and other recent citations can be found on Cal/OSHA’s website. Yet even the steepest OSHA fine is unlikely to make a pockmark in the corporation’s finances. In 2012 Chevron reported fourth quarter income of $7.2 billion and total earnings of $26.2 billion. That means that the multinational energy company earns $1 million in global revenue every two minutes. 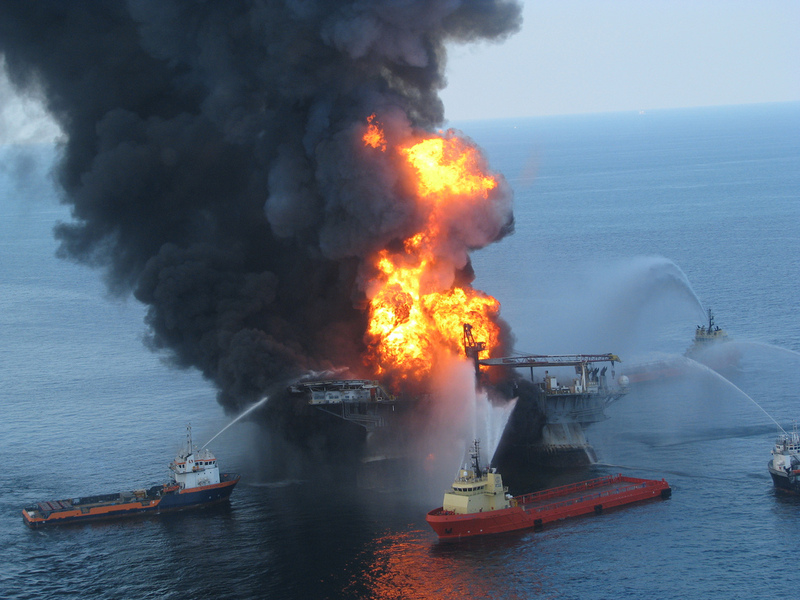 Coast Guard boats attempting to subdue the Deepwater Horizon explosion, which killed 11 people in 2010. Image used under Creative Commons from Ideum. Between the Chevron Richmond refinery fire, the 2010 Deepwater Horizon tragedy in the Gulf of Mexico, and a deadly refinery blaze that killed 47 workers in Venezuela just weeks after the Richmond incident, regulating workplace conditions at oil refineries Is sure to remain foremost on OSHA’s list of enforcement priorities.